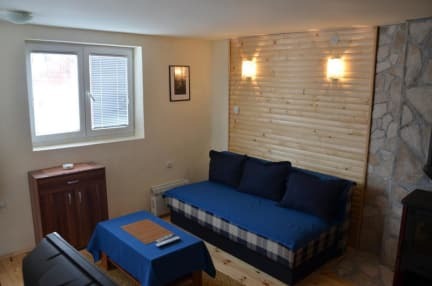 Guesthouse Andjelich, Zabljak, Czarnogóra : Rezerwuj teraz! In case of cancellation 7 days prior to arrival no penalties will be applied. In case you cancel 3-1 days prior to arrival penalty in amount of one night stay will be charged. In case of no show full amount will be charged. Tax is not included in above prices. The customers are required to pay 1.00 for the tax per person per nigh. The guest is required to pay the amount of sojourn tax upon arrival. Tax is not included in above prices. The customers are required to pay 1.00 for the tax per person per night. 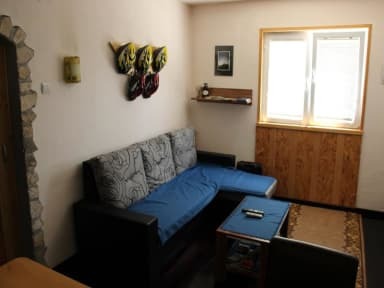 This is a Guest house with the personal touch of the owner and an excellent choice when coming as a group. The Guesthouse Andjelich is located in the center of town, just behind the central Bus station. We organize rafting, biking hiking, canyoning and off road tours. Free Coffee and Tea ! I missed a normal-sized closet (I spent a week there, you know). OK, we a bed for a third person to lay stuff. Our basement room was also kind of damp. Apart from that you could find all the necessary equipment inside (even helmets for biking!). Probably the helpful host, Zarko, was the biggest advantage of the place. Not only was he keen to direct us to main local atractions, but he also knew about Balkans as a whole and was ready suggest places worth visiting. Very nice!